As the world of medical imaging moves on with great rapidity, we mustn’t forget those great pioneers who helped us achieve the breakthroughs we take for granted today. Here, Professor Graeme Bydder of the University of California, San Diego, reflects on the life of the man he knew and admired. 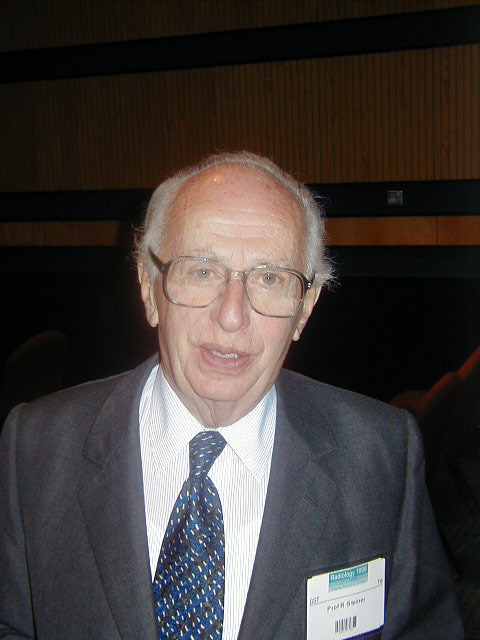 Robert Steiner, former professor of Radiology at the University of London and chairman of the Department of Radiology at the Royal Postgraduate Medical School, Hammersmith died after a long illness on September 12, 2013 at the age of 95. Professor Steiner established and ran the leading academic Department of Radiology in the UK for many years. He was president of both the British Institute of Radiology and the Royal College of Radiologists and had a major role in the development of cardiac and pulmonary angiography as well as that of magnetic resonance (MR) imaging. He was born in Prague in 1918 which was then part of the Austro-Hungarian empire, and moved with his family to Vienna at the age of three. He began studying medicine at the University of Vienna in 1935. He was about to complete his preclinical studies at the time of Anschluss, the political annexation and military occupation of Austria by Nazi Germany on March 12, 1938. Members of his medical class who expressed an objection to this simply disappeared. He needed a further two months to complete the first part of his medical degree, and after doing this, escaped through Italy to Dublin in May 1938. He finished his medical training in Dublin in 1941 and worked in the Emergency Medical Service in the UK from 1941 to 1945. He trained in radiology at the United Sheffield Hospitals from 1944 to 1950. He was appointed Assistant Director of Radiology at Hammersmith Hospital, London in 1950. At that time much of the equipment in the department was of pre-war vintage and the Director had radiation damage to his hands. Over the next 10 years, Professor Steiner became Director, recruited new staff, replaced equipment and established a very active teaching program. He was appointed the first professor of Diagnostic Radiology in the University of London in 1961. He established a research program concentrating on cardiac and pulmonary angiography. This was essential for the assessment of valvular disease in the newly developing speciality of cardiac surgery. He also encouraged senior faculty within the department such as Peter Lavender, David Allison, John Laws, and Thomas Sherwood to develop their own areas of expertise to international level. Tutorials were held on Monday evenings often with radiologists from around London bringing problem films. They were also held on Friday afternoons at 5pm in case any trainees had the idea of going home early. Private practice was banned. This meant that there was generally more consultant time available for teaching and research than at other London teaching hospitals where this was not the norm. Professor Steiner helped train a succession of radiologists who went on to occupy senior positions in departments throughout the world. These included John Laws (Kings College), Thomas Sherwood (Cambridge), Lenny Tan (Singapore), Constantine Metreweli (Hong Kong), Andy Adams (Guy’s and St. Thomas’s), Brian Ayers (Guy’s and St. Thomas’s), Maurice Raphael (the Middlesex), John Stevens (St. Mary’s and Queen Square), Dennis Carr (the Brompton), Gary Lawler (Melbourne), Tony Leung (Sydney), Nandita deSouza (the Royal Marsden), Peter Dawson (UCH), Walter Curati (Ealing), Derek Kingsley (Queen Square), Rolf Jager (Queen Square), Takayuki Ouchi (Chiba), Alina Greco (Monaco), David Robinson (Abergavenny), Adrian Thomas (Bromley), Mary Ann Johnson (Edmonton), Susan Peterman (Atlanta) and Steven McKinstry (Belfast). There were also paediatricians (Lilly Dubowitz, Francis Cowan, Mary Rutherford, Linda de Vries and David Edwards), and physicians (John Brown, Mark Doran, Maria Barnard, Simon Taylor-Robinson) who benefited from his training. He strongly supported research radiographers (Jackie Pennock, Linda Banks, Di Spencer, Janet Sargentoni, Anne Case, Angela Oatridge, Susan White, Elaine Williams, and Serena Counsell), scientists (Jane Cox, Jimmy Bell, David Gadian, Richard Iles, Louise Thomas), psychiatrists (Basant Puri, Eve Johnstone, David Owens), and anaesthetists (David Menon, Carol Peden, David Harris), who worked within his department as well as Margaret Kirk, Patricia Hamilton and Dulcie Rodriguez. Professor Steiner established very fruitful collaborations and exchanges with faculty of leading radiology departments in the United States, British Commonwealth and elsewhere in the world. He hosted numerous senior radiologists on sabbatical leave including Richard Greenspan (Yale), John Doppman (National Institutes of Health), Robert Fraser (Birmingham, USA), Ian MacKay (Hartford), Michael Vermess (NIH), Harold Davidson (Oklahoma), Bob Berk (University of California, San Diego) and Moshe Graif (Tel Aviv). These visitors made a substantial contribution to the department. He was elected president of both the British Institute of Radiology (1972-73) and the Royal College of Radiologists (1977-80), as well as the Fleischner Society (1973) an international multidisciplinary society dedicated to the diagnosis and treatment of diseases of the chest. It was named after Felix Fleischner a chest radiologist who also left Austria after Anschluss, and worked at Massachusetts General Hospital. During the 1950s and 1960s there was what seemed an inevitable shift in radiological leadership from Sweden to the US, but quite unexpectedly Sir Godfrey Hounsfield FRS produced the first head clinical computed tomography (CT) scanner in 1971. It was a spectacular success. This was followed by body CT scanners in 1974 and 1975, and the beginning of the modern era of radiology. Britain was at the centre of it, led by a company, EMI (Electric and Musical Industries Ltd) with a remarkable record in acoustics, electronics, TV and radar going back to Alan Blumlein in the 1930s, but no previous experience in the medical field or in x-ray technology. This was followed by the initial development of MR imaging heralded by the first image published by Paul Lauterbur in 1973. Much of the subsequent development of the technique was performed by groups in the UK based in Aberdeen, Nottingham and London (EMI). There were many difficulties and the first international conference on MR imaging held at Vanderbilt University, Nashville on October 26-27, 1980 was only a limited success mainly due to the lack of convincing clinical results. What was necessary for MR imaging to receive the large scale investment needed for future progress was a major medical application in which the new technique had a substantial advantage over state of the art CT. This Professor Steiner achieved with Ian Young FRS and his team from EMI, in the MR imaging of plaques in the brain in multiple sclerosis (MS). These were shown on a scale not previously seen except at post mortem. MS was a disease that had not previously received significant radiological attention and it seemed an improbable starting point, but MS has since become the single disease of the body most studied with MR. The system the work was done on used the first whole body cryomagnet built by Oxford Instruments, a university spin-off company founded by Lady Audrey and Sir Martin Wood FRS. The work was remarkable in other ways. During this period EMI sold its CT business to General Electric at a knock down price following its unsuccessful venture into the US, and was trying to sell its MR business. The Medical Research Council (MRC) closed down its CT operation at Northwick Park Hospital, London in 1980 and soon after closed down its ultrasound research there. The MRC would not support clinical MR work at Hammersmith and the leader of the Hammersmith MR group, Frank Doyle suffered a catastrophic stroke before clinical studies began, and never worked again. The only significant outside support came from Gordon Higson, Director of the Scientific and Technical Services Branch of the DHSS. The success with MS was followed by other major applications of MR including diagnosis of disease in the posterior fossa (where CT was degraded by beam hardening artefacts, 1982-3), use of the heavily T2-weighted spin echo sequence which provided very high soft tissue contrast (1982), paediatrics (no ionizing radiation, 1982-3), the first clinical study with gadolinium-DTPA (opening up the MR study of intracranial tumours, where previously the use of intravenous iodinated agents had given CT a major advantage (1984), high contrast fat signal suppressed sequences for body and musculoskeletal applications (1985). These developments helped keep the UK at the forefront of clinical MR research until, and beyond the ISMRM (International Society for Magnetic Resonance in Medicine) meeting at the Barbican, London in 1985. It also provided time for other groups to mobilise including those led by Donald Longmore (the Royal Brompton), Ian Isherwood (Manchester), Donald Hadley (Glasgow), Ian McDonald, George du Boulay and David Miller (Queen Square), Ian Kelsey Fry (St. Bartholomews, London), Jonathan Best (Edinburgh), Paul Goddard (Bristol), Adrian Dixon (Cambridge), Peter Cavanaugh (Taunton), Stephen Golding (Oxford), Philip Robinson (Leeds) and others to add to the radiological work already done by Frank Smith (Aberdeen) and Brian Worthington FRS (Nottingham). Oxford Instruments expanded rapidly and captured most of the world market for whole body cryomagnets. The success with MR showed that the earlier success with CT could be repeated, and major developments in other areas of radiology followed including remarkable advances in ultrasound, nuclear medicine, interventional radiology, PACS and digital radiography. These helped transform the speciality of radiology and create the modern era of imaging. Professor Steiner contributed in many different ways to these developments. He brought to the many tasks he undertook very high standards, and a wide ranging strategic vision, but it was his sense of fairness and justice that endeared him to people at all levels, and led them to trust him without reservation on personal and professional matters. He was appointed CBE and was the recipient of the gold medals of the Royal College of Radiologists and the European Society of Radiology. He also received honourary degrees, fellowships and memberships from universities and radiological societies around the world. He was strongly supported by his wife Gertie. She is remembered with great affection as a gracious hostess as well as a source of encouragement and wise counsel by generations of staff, faculty and visitors to the department. Gertie and Robert met in Dublin and married in Sheffield in 1945. They had two daughters, Hilary and Ann. Hilary has two children Christopher and Sarah, and one grandchild. Ann has three boys Tim, Will and Bertie. Robert had two sisters, who together with their families escaped from Vienna to Australia where they settled, and a brother Herbert who studied physics at Cambridge, and remained afterwards in England. Robert’s father and stepmother spent the war years in France, then went to England before returning to Austria. Graeme Bydder was born in New Zealand in 1944 and trained in medicine at the University of Otago, Dunedin. He graduated in 1969. He subsequently trained in medicine in New Zealand under Keith Macleod before receiving a Nuffield fellowship to train in CT under Louis Kreel at the MRC Clinical Research Centre, Northwick Park Hospital, London in 1978. His main work was on CT attenuation values in fatty disease of the liver, iron overload, and bone disease. He worked at the Royal Postgraduate Medical School, Hammersmith Hospital under Frank Doyle and Professor Steiner from 1981 onwards. His main research activity was technical development and clinical application of magnetic resonance (MR) imaging in conjunction with Ian Young FRS and his team. Professor Steiner provided strategic and tactical direction for clinical MR imaging at Hammersmith from its inception in 1981 to his final retirement in 1998. Graeme moved to the University of California, San Diego (UCSD) in 2003 and since then has worked on MR imaging of short T2 components in tissues, qualitative and quantitative approaches to MR imaging, and MR microscopy of the musculoskeletal system. In addition to the benefitting from working under Professor Steiner, Graeme was fortunate enough to work for two of the “three wise men” (Louis Kreel, Frank Doyle, and Jamie Ambrose) who did early experimental work on Godfrey Hounsfield’s prototype CT system and advised the DHSS to proceed with development of the technique in 1969.